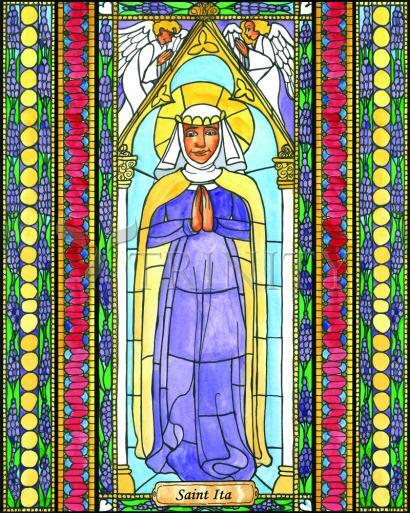 Born of noble parents, Saint Ita was given the name Diedre. Her mother was a princess and her father a chieftain. Even as a child, Ita was so good and holy that no one was surprised when she wished to devote her life to God. Surprised or not, her father refused to let her consecrate herself and wished to arrange a marriage which she in return refused. Ita set off with a few companions and her sister to live the life they choose, for God and God alone. They journeyed to Killeedy where Ita founded a convent spending the rest of her life there. Her convent became a training school for young boys. Many of which became great men in the church, earning Ita the nickname “foster mother of the saints.” One of the boys she mentored was Saint Brendan, the great navigator. He often came to visit Ita between his voyages and sought her counsel throughout his life. Today, Ita's grave is still visited and often covered with flowers even 1,500 years later. Near her grave is also a holy well, known to cure many ills over the centuries. Her feast day is January 15. After St. Brigid, St. Ita is the most famous woman saint in Ireland. Her birth of noble Christian parents, Kennfoelad, a Déise Chieftain and Necta his princess wife, is said to have taken place around 470 near Faithlegg outside Waterford. From her baptism on she was filled with the Holy Spirit. All marveled at her childhood purity and behavior, and her abstinence on the days she had to fast. She was prudent, very generous, kind toward everyone, and gentle as well as chaste in her language. As she grew up, it quickly became apparent that she wished to devote her life to God. There is no doubt Ita excelled in the ‘Six Gifts" of Irish womanhood the ancient Celt looked for in the well-educated girl - wisdom, purity, beauty, music, sweet speech, embroidery. She refused an offer of marriage as she wanted to consecrate herself completely to Christ. Her father refused her. She went at once to an aged priest she had known from childhood and publicly made her vows which she had already formed in her heart. She left her father’s house and the pleasant places round it and set out with some companions for the Ua Conaill territory in the West of Munster, the present Co. Limerick, to a place called "Cluain Creadhail" which some interpret to mean "Meadow of Faith" and which is now called Kileedy. There is a strong local following of St. Ita in Munster, particularly in Waterford and Limerick, and her name is a popular one for Irish girls. In the middle of the nineteenth century, a new move was made in Ireland for recognition of her importance in the Catholic church; this was accomplished when Bishop Butler of Limerick obtained from Pope Pius IX a special office and mass for her feast which is now kept on January 15.